There are three main points I want to comment on. 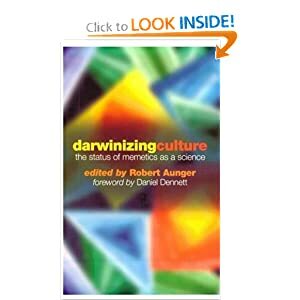 First, Dan Sperber's representation of Richard Dawkin's concept which I think is mistaken. Second, Dan's critic of Richard's Chinese whispers argument. Third, Dan's final argument against memetics of inference VS copying. Dan Sperber seems to misunderstand, or at least misrepresent, the concept of meme as Richard Dawkins introduced it. Richard Dawkins defines “memes” as cultural replicators propagated through imitation, undergoing a process of selection, and standing to be selected not because they benefit their human carriers, but because they benefit themselves. Richard Dawkins indeed defined memes as replicators but he did not mean to say that they only benefit themselves in the way Dan implies it. They surely do benefit themselves but they may benefit their hosts as well, and there is nothing in the definition of a replicator that forbids it. Benefiting oneself is not exclusive of benefiting others. Furthermore, most replicators benefit themselves simply by benefiting their hosts, because it is the very best route for their replication process. In most cases it is in the replicator's interest to benefit the host and we can reasonably expect it to be the case with memes as well. Dan then consequently says that memes are aggressive things such as chain-letters or he suggests that this view sees memes as invading and recruiting minds only to further their own propagation. Here Dan is using a language that is personifying the memes in a way that Richard Dawkins has always warned against. Memes (or genes) don't “invade” nor “recruit” they simply happen to be successful at being copied. Memes are not conscious and they don't have plans. Dan's choice of vocabulary is certainly not helping to get the right picture and is misrepresenting Dawkins' view. Dan Sperber then continues and reacts to one of the later arguments of Richard Dawkins where Richard tries to make a case for the existence of memes. I won't go back to Richard's argument, which might indeed be worth criticising, I will instead concentrate only on Dan's argument which can be analysed on its own. In a thought experiment, Dan explains that when people copy a random drawing from memory, they perform very badly but when they copy from memory a recognisable shape such as a five-branched star they perform very well. Dan explains that if they perform so well it is not because they copy the star but because they create a new drawing from what they recognised as a well known star. Therefore Dan claims that, in this case, the condition (3) of his definition is not satisfied, in other words that the new drawing of a star was not a direct copying resulting from the details of the first star, but rather a simple reproduction of the star that was already known before the test. I have two simple objections to that point. First, even if the copy is not a copy of the original star from the test, there is nevertheless a copy being made of the very first star that we learned about, long before the test. There had to be a first initial exposure to the star in the past so that the star could then be reproduced again in that future test. This suggests that even if the copying process that Dan is criticising is indeed not a real copying process, there might still be an underlying copying process going on, on a larger time scale. So if one looks at the test on a larger scale, we might realise that condition (3) is indeed satisfied, except for it's not the same object A that we should consider, A being that very first star we encountered. Second, there is still something being copied in this particular test, and even so when copying a random drawing. People are not just copying the drawing, they are copying different aspects of the drawing. One of which, for example, is the fact that it's a line drawing, that the line is dark and that it is on a light coloured piece of flat material. All of those could be copied faithfully regardless of whether the drawing itself is resemblant or not, and probably, even if the person doing the copying never used a pen and paper before. So, in a way it is unfair to say that there is no copying going on here. These points should not be downplayed I believe, and again they would satisfy Dan's own definition. Also, Dan ignores the inherent complexity of a random drawing. Computer scientists know too well that random data is the most difficult type of data to store because it is incompressible, in other words there are no rules that would allow to store it in a simple way. The same goes for our brains. Therefore when copying a random drawing one needs to remember a lot more than when copying a geometrical shape for example. Another way of looking at it, is that a random shape would make a bad replicator indeed. Because it demands more effort to remember it. Therefore, it is little surprise that a random drawing will generate worse copies of itself than a nice regular five-branched star would. The last point is probably Dan's strongest argument against memetics. The argument is quite simple and goes more or less like this. When a child learns how to speak she naturally learns the grammar, although nobody has actually explicitly taught her the rules of grammar. That is because the rules of grammar have to be inferred from the context by the child, thanks to her genetic propensity to do so. Therefore, Dan rightly suggests that grammar, and probably most of our culture, is not learned through a copying process but through inference, which, if it were true, would undermine seriously the very idea of memes. The process that generates grammar rule B, obtains the information that makes grammar rule B similar to grammar rule A from grammar rule A. But, if anything, this only shows that Dan is not quite consistent with his own ideas. This doesn't say whether his definition of replication is good and whether this counter-argument is valid. To answer this question we simply need to go back to the original definition of the replicator and ask the question. Is there such an entity as a grammar rule A that is being successfully and sustainably replicated throughout a population? I believe we can confidently answer yes, and that's all it takes for grammar rule A to fit the definition of replicator. Thus the cultural nature of grammar rule A would make it a cultural replicator, i.e. a meme. From the meme's eye view, it is irrelevant whether there is a genetic propensity for grammar rules to exist or not, it's only the result that counts, i.e. whether it is replicated or not. But, it is relevant from a memetic evolutionary point of view in order to try and understand what will determine which of all grammar rules will be most successful. A genetic propensity for learning grammar rules is indeed a catalyst for those types of memes. My overall impression of the objection by Dan Sperber, is that Dan has perhaps not understood every detail of Dawkins' idea. As a result, Dan tries to criticize a false idea of memetics. This is unfortunate given the quality of Dan Sperber's analytical mind. This is the reason why I always try to show how important it is to understand the idea of the replicator and being able to take a meme's eye view on culture. It is not really Richard's work that I try to defend here but the replicator idea itself. It is an extremely powerful idea that has been remarkably conveyed and developed by Richard Dawkins but I also hold my own opinion on some aspects of memetics and I think there is much to be done still. I think the issue has cropped up due to the attempt to link memetics and genetics. From a practical point of view, memetics can be used to solve many problems humans are facing today. For example, despite many many instances of past societal collapses, humans seem to be unable to do anything about the present dangerous situation humanity is facing. I believe it definitely has something to do with memetics in that we seem to be prisoners of our memes. humans don't seem to be able to connect slow moving cause and effects either and this is especially true for very large populations. Thanks Sumant for your comment. You are making a good point. I tend to think that if we could develop memetics it would help us work out which memetic processes drive us and how to influence our culture so that we control it more than it controls us. Maybe then can we focus on those important issues which usually get lost in our saturated memetic universe.